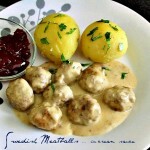 Everybody loves those Swedish meatballs they serve up in IKEA stores … c’mon, admit it! Yummy meatballs smothered in their signature brown gravy … mmm! But what to do if you don’t live near an IKEA or cannot be bothered queuing up for a plate of these delectable treats? Well, make them yourself of course. I did, and they came out really well. Chicken Mughlai is yet another famous dish bourne out of the royal kitchens of the great emperors of northern India. 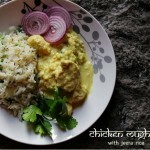 It is a beautiful dish of tender chicken cooked in a rich, creamy nut gravy. With it I am serving jeera rice … a wonderfully fragrant rice dish made by adding toasted cumin seeds, onions and coriander. 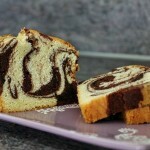 I like old-time favourites like this simple butter cake which I then turned into a visually pleasing marble cake. It is moist and flavourful, with a generous hit of chocolatey goodness. No icing needed … just the way I like it. Mmmm, I think I will have more tea with my cake, please. 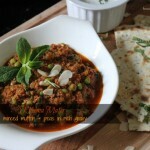 Kheema Mater is a rich minced mutton dish cooked with peas in a wonderfully savoury gravy and it comes straight out of the royal kitchens of the great Mughal dynasty. While a large portion of India observes a purely vegetarian diet, those living in the north in particular relish rich meaty dishes cooked to perfection in creamy sauces. Many of these dishes were influenced by the Muslim rulers of the time, and obviously if it’s feeding the king, then it’s got to be good-eats. Classic banana bread. You can rarely go wrong with this choice of cake. So wholesome and comforting, it will bring a smile to anyone who chomps on a slice. 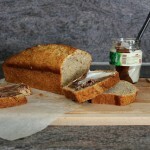 Cut into thick slices and smear with hazelnut spread for something extra.